“Blind holes” are often used inside such machines as large appliances or on car engines. A blind hole is a type of stand-off mounting hole that goes to a specific depth without continuing through the opposite end. This prevents a mounting screw or other fastener from poking through and potentially damaging other components. But turning screws and adding extra mounting hardware takes time, especially in spaces difficult to access. 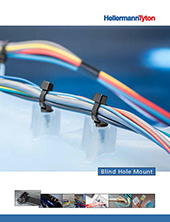 Our Blind Hole Mount Cable Tie accelerates and simplifies the mounting process. No tools needed – simply press it in for an instant, secure attachment. Each mount comes pre-assembled with an inside or outside serrated cable tie or offset cable tie to quickly mount bundles in high-volume production settings or for repairs in the field. Central to the Blind Hole Mount Cable Tie product family is its innovative, proprietary mount – a metal locking mechanism secured to a nylon body. The metal component flexes to allow easy insertion. Once attached, its uniquely angled design delivers the extraction force manufacturers require for common electrical applications. If desired, installers can remove the mount nondestructively with a twist. This not only protects the blind hole from damage, it makes the process quick and effortless. In most situations, this can be done by hand, though a hex driver can also be used. Manufacturers and installers want simpler fastening solutions that reduce or eliminate time-consuming operations, hand fatigue and repetitive strain injuries. Enter HellermannTyton engineering. Spending time in the field with automotive and appliance manufacturing customers, we saw several alternative blind hole fastening methods. Some companies used screws to attach the mount, with the addition of one or two additional components to hold wires. Others used messy glue to hold the mount inside the blind hole. Still others utilized inferior designs that were prone to vibrating out of the hole. Our engineers came through with a sophisticated solution that the operator simply presses into the blind hole using a thumb. The HellermannTyton Blind Hole Mount delivers on the promise of quick insertion and quick maintenance if ever needed. To remove the bundle on our 156 series, cut the tie and leave the mount. You can then reuse the mount with a new cable tie or remove the mount as well. With our offset Blind Hole Mount, the hex head is always accessible for easy removal without cutting the cable tie. With our all-plastic model, simply cut the tie and unscrew the mount. 156-01807 Outside-serrated, 6-inch cable tie and mount for use with threaded or nonthreaded holes. 156-01796 Outside-serrated, 8-inch cable tie and mount for use with threaded or nonthreaded holes. 156-01726 Inside-serrated, 8-inch cable tie and mount for use with threaded or nonthreaded holes. 157-00329 Inside-serrated, 8-inch cable tie and offset mount for use with threaded or nonthreaded holes. 157-00112 An all-plastic model is designed for use with threaded holes only. No extra hardware or messy glue makes assembly fast. Cable tie and mount preassembled for added convenience. Easy to remove for fast bundle change-outs. Heat stabilized material provides excellent resistance to high temperatures. 1. Press mount into blind hole. Offset hex-head mount: Use a 5/16” hex driver to unscrew mount from threaded or nonthreaded blind hole, leaving cable tie intact if desired. Standard hex-head mount: Cut cable tie and use a 5/16” hex driver to unscrew mount from threaded or nonthreaded blind hole. All-plastic mount: Cut cable tie and rotate mount out of threaded blind hole.